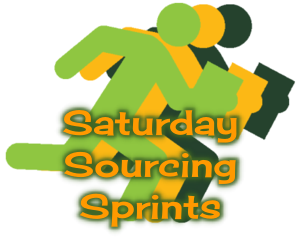 Join in on this week's 24-hour Saturday Sourcing Sprint! It's basically a casual mini Source-a-Thon. When it's Saturday where you are, get sourcing! Anytime you want to compete for the Weekly Winners badge, click answer at the bottom of this post, We use the Challenge Tracker to record the profiles we sources. Tell us about your successes, discrepancies, stories that tug at your heart strings, and new amazing sources. We have a Google Hangout if you'd like to join us. It will be as busy or quiet as we make it. All profiles improved must come from the Unsourced categories or be already present on WikiTree and only have links to other profiles, links to search results from another genealogy website, or the words "Ancestry tree," "Geni.com," "Pedigree Resource Files" from FamilySearch, and the like. Do not delete these items as they can provide clues for other researchers. "Looked for John in the US Census records for 1900-1940 and couldn't find him on FamilySearch or Ancestry"
Sources citations need to provide a way for anyone to find the source. We strive for the Evidence Explained format to tell where, what, who, and when, as well as where the was source was found. Do not delete existing items in the Sources area as they can provide clues for other researchers. Examples of citations can be found in the Tip of the Week first comment in each post and in the Citation Example page where the Weekly Tips will be archived. If you add a source which names other family members, check to see if their profiles exist. See the Sprint Help Page for full details. When you save the profile, a green bar for the Challenge Tracker will appear at the top. Due to the security changes for the implementation of GDPR regulations, unlisted profiles are not eligible for challenge tracking. For all others, click the Challenge Tracker button, add or verify your WikiTreeID, select a pre-defined comment or add your own to indicate which type(s) of source(s) you added, put a check mark in the "Saturday Sourcing Sprint" box, and click "Add Action." If you participate in the Monthly Sourcerers' Challenge you can click both boxes. For visual learners, this YouTube video starting at about the 4.30 minute mark will explain how to use the tracker (earlier parts of the video explain how to find sources and add the citations to profiles). You can track your progress on the Challenge Tracker report. Don't forget to removed the Unsourced template if you are able to add a source! This is not an endorsement of any one source or citation style. Tips are provided to help you learn how to cite the sources you find. There is no requirement to look for sources of this type. New England Historical and Genealogy Society, New England Historical and Genealogical Register, v. 40 pg 208. I would like to have seen a little more information though. For instance, the title of the article and a note about what evidence was being used from that source. We have already surpassed the 2017 total and averaging more than a thousand per month. Based on that, it is possible that we could break 13,000 for 2018! Great information , thanks. I will be helping in the sprint tomorrow. Good to see you both, Sarah and Katie. Good luck sourcing. By the way, if you interested in winning the weekly sticker, please click answer and add a reply. I can't add a star to comments. Definitely interested in winning the weekly sticker. Sarah, scroll up or do a search for the "answer" link. Click that and add your own answer. Sorry I thought I had added it as an answer. Have now done so. Count me in again this week. Congratulations, Sarah, on sourcing the most profiles in this weekend's Sprint. Way to go! I have quite a few in need of updating Michelle because I imported a large GEDCOM. Some are no longer connected to my family after further research but may eventually get reconnected. I'm doing the same as I have a bunch that were anecdotally sourced and are in dire need of more legitimate sources. I was so glad to see your post as I have done the same thing! Always nice to know I'm not the only one! I'm in for this Saturday. Celebrating my two daughter's December Birthdays today, but I'll do what I can. I am in for a few today. Exciting to see the updated stats, I'm sure that helps make everyone feel good about doing these challenges! New at this, but thought I'd give it a try. I plan to add sources. I noticed profiles sourced with Find A Grave links, do not always go directly to that persons memorial. I plan to correct and fix links to include Find A Grave memorial I.D.'s. Happy Holiday's & Seasons Greetings! I plan to add sources. I live Sydney, Australia. Thanks, Julie. I have just posted the 8 Dec thread. Would you add an answer there so that I can keep track easier. Thanks!